Those darn selfish polar bears. The people who promote climate change hypothesis have been writing for years that polar bears will all die because the earth will heat up and all the Arctic ice will melt. But those stubborn polar bears either can’t read or maybe because they want to hurt the Al Gore set’s feelings, because their population is growing. In fact, the population is growing so big that the native Inuit peoples living in Northern Canada are being threatened. The climate change enthusiasts are totally pissed off because a new Canadian government report saying that the polar bear population is booming. What is uncertain is whether they are angry at the Canadian government for writing the report or the polar bears for not dying. The new study finds that the polar bear population has grown so much that they are now competing with the native Inuit peoples living in the area. “Inuit believe there are now so many bears that public safety has become a major concern,” the proposed plan, which has been seen by the Canadian websiteWindsor Star, claims. The Inuit people are there, and the scientists are desperately trying to prove the world is ending. Who are you going to believe? 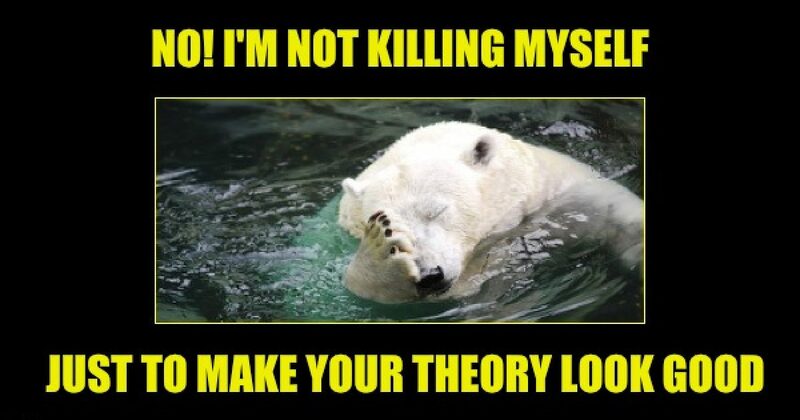 Possibly to avoid being viciously attacked by the climate change crazies, the Canadian report also says that even though polar bears are probably affected by climate change, the animals are adaptable and will not necessarily die out because of climate change. But a better reason for the increase in population is that no adaptation is necessary after all Arctic sea ice volume is up 30% over the past ten years. But please don’t tell the climate crazies they hate facts that disagree with their hypothesis. They won’t even recognize the facts…will just call you names like denier or science hater (and when you leave they will cry).